With another year almost over, I decided to get back on the wagon and write a year end post / Christmas letter. I first started this back in 2010, but then slacked off in 2011. However, missing the update two years in a row would be unacceptable, so I brought this back. I'll actually start at the end of 2011, since thats when the good stuff happened. On December 12th, the company I co-founded in 2010, Educreations, launched our iPad app in the iTunes App Store. Within 4 days, the app hit #1 in the educational app category, and broke the top 200 overall free apps in the store. Since the launch, just over a year ago, we've seen some amazing lessons created by over 100,000 teachers in over 20,000 schools. 2012 also saw us raise $2.2M of investment funding from some great investors: Accel Partners (they've also invested in Facebook, Dropbox, Etsy, Spotify), NewSchools Venture Fund and some other great angel investors. The technology blog TechCrunch covered our funding announcement in August. Since then we've continued to have a great reception from teachers and students. The Bay Area's NPR station, KQED, wrote about us in their technology blog after doing a bunch of teacher interviews. So Educreations is going great, we just celebrated our 2 year birthday and I'm loving what I'm doing. I'll reverse back to the beginning of 2012, which started off in Tahoe, at a ski lease. However, unlike previous years, there wasn't any snow and so we went hiking. Unfortunately, the year continued without snow, leaving the region with one of the smallest snowfall winters in a long time. Which means my ski pass was just about useless. So unlike previous years, I didn't get to snowboard quite as much due to the lack of snow. However, at the time, I was so busy with the company to do much snowboarding anyways. So Winter flew by and soon it was Spring. I once again participated in The Relay, a 12 person group run from Calistoga to Santa Cruz. This year, the team killed it. We finished the 200 mile race in 24 hours, 41 minutes, coming in twelfth out of 200 teams. We killed the course with an average of 7 minutes 37 seconds per mile while still having a great time. In June, I went to ISTE, an annual educational technology conference, which happened to be in San Diego this year. The flight down there ended up being only my second time on an airplane since 2010, when I went to Bali, which was a huge change after my previous traveling lifestyle. The conference was great; we met tons of Educreations users, rented out a bar and bought users drinks and generally got to meet lots people really passionate about education. While in San Diego I also spent time with my Uncles, Aunts and cousins, who I hadn't seen in some time. 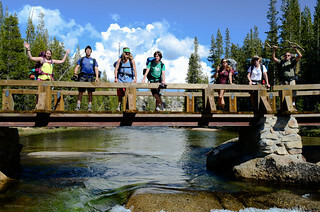 In June, I went to Tuolumne Meadows in Yosemite with family and friends for a 4 day backpacking trip. Yosemite is always beautiful, but this time we had to fend off swarms of mosquitos. Apparently, we happened to get there at one of the worst times for mosquitos, and we were eaten alive. It didn't make it any better that I had chosen to not bring a tent. I thought I was saving weight by leaving behind the tent, when I was actually giving up lots of blood to the swarms. Despite the mosquito attacks, the weather was perfect, and the landscapes were beautiful. In July, I ran my second 50k. I ran my first 50k, about 32 miles, in December of 2011 at the North Face Challenge in the Marin Headlands. I even managed to do pretty well in that race, finishing in a totally respectable 6 hours and 45 minutes. 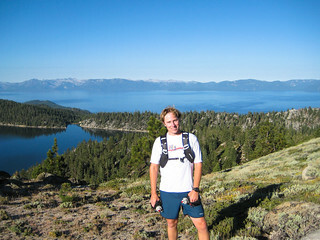 The great showing spurred me to sign up for a second 50k in July of 2012; this time in Tahoe. I signed up for and, to my surprise, finished the Tahoe Rim Trail 50k. I wrote more about it here and posted pictures on Flickr. The Tahoe 50k wasn't as hard as I thought it would be, despite my lack of training and preparation this time around. But I still managed to finish in 7 hours and 49 minutes, again, a very respectable time. I had another 50k scheduled for December (the North Face 50k again), but an ankle sprain on a 30k training run a few weeks before sidelined me for the race. Instead of running the race, I volunteered, which only made not running worse. Volunteering was fun, but it really just strengthened my desire to do more races in 2013. July also saw the Streeters and Nelson families return to Trinity Lake after a several year hiatus. I went up for a long weekend of camping, boating, fishing, wakeboarding and upside-down margaritas. But one of the most anticipated events of the year, for me, was in October. My friends, Dean, Wenzhe and Russ, along with my sister Amy, and I, all flew to the other side of the world to trek in Nepal and eat in Hong Kong. The trip was the first time I'd been outside the US in 2 years; 2011 was the first year since I'd had my passport that I didn't get a stamp, breaking my yearly goal. We left October 12th, and after a very long flight, we all grouped up in Kathmandu where we saw some amazing Buddhist stupas, temples and sights. We spent the first couple of days in Nepal, adjusting the crazy time difference (12 hours and 45 minutes - yes 45 minutes), getting familiar with Nepalese food and exploring a few surrounding towns. A few days after arriving in Nepal, we started our trek on the very new Mardi Himal trek. The trek started at 3,500 ft above sea-level, and within 3 days, we'd climbed to 13,500 ft. The views blew my expectations out of the water and provided a new baseline for what constitutes epicness. I still think South America has landscapes that are out of this world (Bolivia especially), but in Nepal, the tallest mountains in the world rise from nothing within just a few miles. Our trek didn't climb as high as the Peru trek, but the elevation differential on our Nepal trek was much greater. And even though we climbed 10,000 ft, we were fully spoiled. A staff of 10 worked to cook for the five of us, set up tents and haul around most of our stuff. If you haven't seen the pictures from the trek, I highly recommend you check them out on Flickr or on Facebook. After Nepal, Wenzhe, Amy and I had a 4 day stop-over in Hong Kong. This was my first time out of the airport there, and we spent it eating and doing more eating. Oh, and I also got a suit tailored, did a lot of walking and a bit of gambling in Macau. 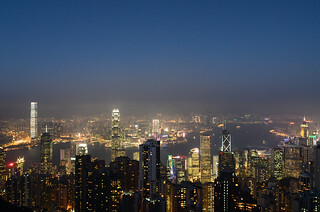 Hong Kong was a totally different experience than Nepal, but altogether a good one. I wrote up a longer post with more information that you should check out if you want to read more. 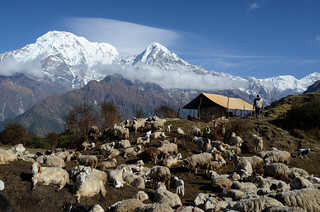 As with Nepal, you can find my pictures on Flickr or on Facebook. As with last time, this turned out to be a lot longer than I had anticipated. But I'm not a concise writer, and a lot happened that I wanted to talk about! You can keep up with me next year on my site, through Facebook, Twitter or through my photos on Flickr. I'd love to hear how your 2012 went, so write back. Hope your 2012 was a good one and all the best next year. Chris Streeter's homepage on the web.